Rod Treviño has been appointed principal of Scarborough High School. Treviño has served as a public school educator for more than 19 years, beginning his career at Johnston High School in Austin ISD, where he taught English and served as chairman of the English Department and assistant principal. Most recently, he was principal of Dahlstrom Middle School in Hays Consolidated ISD. 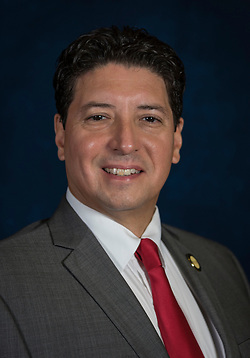 Treviño is a native Texan and received his undergraduate degree in English from University of Texas at Austin and his master’s degree in educational leadership from Texas State University. Most recently, he completed work as a member of the leadership cohort at Harvard University with a specialization in family and community engagement. This entry was posted in Staff updates and tagged Scarborough HS on July 26, 2017 by HISD Communications.